Attempting to complete a full-scale kitchen remodel before the holidays arrive would be rather difficult at this point in the year. There is still ample time left in the season to tackle a range of different smaller home improvement projects before Thanksgiving and Christmas. 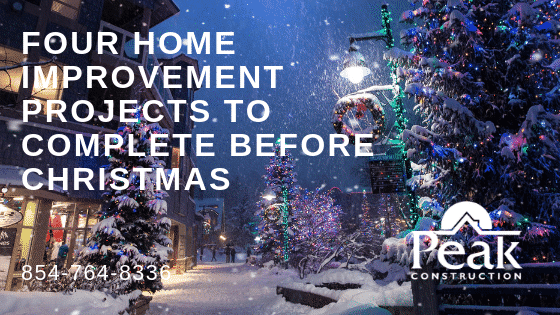 Here’s a look at a few projects that can be finished prior to the holidays without too much hassle. Planning for backsplash installation takes around one to two weeks, while installation tends to take an average of two to three days. When it comes to choosing the right style, you’ll have a host of options available if you decide to invest in a new backsplash for your kitchen. It’s important to keep in mind that simple backsplash styles such as subway tiles can be installed in a day, whereas a more complex design will require additional time for proper installation. Making arrangements for new kitchen countertops requires at least two weeks in order to complete the processes of templating and fabrication, but installation can often be completed in two to three days. Opting for new countertops is an excellent way to add an extra dose of personality to your kitchen as you prepare to cook and host holiday gatherings with your family and friends this season. Preparing to have new flooring installed takes around one to two weeks total, but the process of installation can be finished in two to three days. With a wide range of flooring choices available, you’ll have no problem finding an option that aligns with your style and budget. Since flooring has a major impact on the overall ambiance of a room, investing in this home renovation project is the perfect way to re-vamp the look of a room just in time for the holidays. Much like flooring, walls have a large impact on the overall ambiance of a room. Giving a room a fresh coat of paint is also a cost-effective way to transform an area of your home, and the job can generally be completed within three to four days depending on the size of the room you plan to paint.